Earth is a really huge place. To function as society we need to be able to locate and describe exact positions on Earth. To achieve this goal we have established a system of latitude and longitude. We express both latitude and longitude in degrees because they are measured as angles from the center of the Earth to a point on the surface. Latitude is a measure of the distance to a point from the equator. The equator is an imaginary line that runs around the middle of the Earth like a belt. The equator has a latitude of 0 degrees. 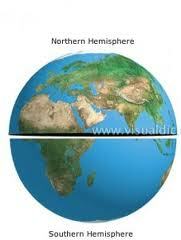 Lines of latitude circle around the globe without ever touching each other because they are parallel to one another. For this reason, we call them parallels. Points that are located below the equator are in the Southern Hemisphere, so their latitudes are measured in degrees South. The possible range of latitudes goes from 0 to 90 degrees N or S.
Longitude is a measure of the distance of a point to the Prime Meridian. The Prime Meridian is an imaginary line on the Earth from the North Pole to the South Pole. It runs through Greenwich England. Longitude lines are not called parallels because they are not parallel. They bend with the Earth and eventually they all intersect at both the N and S poles. Because they bend like this and intersect the distance between degrees of longitude changes. Points that are located East of the Prime Meridian are in the Eastern Hemisphere, and are measured in degrees East. Points that are located West of the Prime Meridian are in the Western Hemisphere, and are measured in degrees West. The possible range of longitudes goes from 0 - 180 degrees. This formatting is very important. Latitude must be written first followed by either North or South. Longitude must be written second followed by degrees East or West. Any other configuration is incorrect.